I'm convinced that the asteroid belt is the remains of a sizeable planet (or two) that was shattered in a collision. I therefore wouldn't be at all surprised if a small number of asteroids were composed, to a large extent, by gold and other precious metals, which are believed to be concentrated near Earth's core. That said, it would probably be pointless trying to get rich by mining them, as a) it would be a hugely expensive exercise b) the law of supply and demand means the price would collapse, due to the sudden increase in supply. I'm convinced that the asteroid belt is the remains of a sizeable planet (or two) that was shattered in a collision. "What if most of the debris was thrown out of the solar system, and the asteroid belt is what remains? We know this isn't the case for a few of reasons. First, any explosion or collision wouldn't be powerful enough to throw material out of the Solar System. So if it were a former planet we'd actually see more debris." It's a crazy idea that the absence of material must mean that it was ejected from the solar system. Far more likely that it happened very early in the life of the solar system, and the pieces were hoovered up by the gravity of the sun and planets. Nope. As they say, the types of asteroid are too different to have come from one or two bodies. That's based on the obviously erroneous assumption that planets have a uniform composition throughout their mass. Fact is, most of Earth's iron is deep down, and nearer the surface it's rock. Near the core, it's believed that denser elements than iron are more common. So, if the Earth were fragmented due to a collision, the asteroids that were formed would have very different compositions, from rocky, to iron/nickel, then heavier elements. Nope, it is based on the work and observation of real scientists. If any other scientists think otherwise, I'd be happy to read their papers. Providing they are in respectable, relevant, peer-reviewed journals, of course. Nope, it's based on the conclusions drawn by your so-called 'real scientists' from the observations, and from what I've seen, having a PhD, doesn't mean that you have any talent for inductive reasoning. That can't be taught. You either have it or you don't, and it appears to be woefully lacking in the astronomy/cosmology community. You appear to have a blind spot regarding the fallibility of inductive reasoning. You appear to have nothing. Just another crank, pushing crank ideas on a comments section. Not worth a damn. To solve the light horizon problem, inflation theory was born. This tells us that when the universe was between 10 to the -35 and 10 to the -32 seconds old, it underwent a faster than light 10 to the power of 50 expansion - to the size of a grapefruit. So go write it up. There are lots of these metallic meteorites, and now that we know what we're looking for, we might find evidence of volcanism in them . . . it might have holes in it left by escaping gas. I have a small, but interesting, meteorite collection, including sliced, polished and etched meteorites. They prepare iron-nickel meteorites this way so you can see the Widmanstätten patterns. I have others that are not sliced too. None of mine have small holes in them, but as the authors pointed out, I will keep an eye out for them going forward now that I know what to look for. But the mass of the entire asteroid belt is still only a few percent the mass of Earth. So if true, most the planet(s) was flung off into space. Unless of course your market were not on Earth. Just imagine if you needed strong iron-nickel alloys to build a wide variety of space structures and spacecraft components. IMHO, NASA is going to 16 Psyche because they are very wise. Learn some science, impress the public, inspire some bright kids and take inventory of the solar system for the asteroid miners. When I watch Star Trek, I often find myself thinking, "We have got to find a way to make this possible." But let's face it, It is impractical to build a fleet of thousands of spacecraft like USS Enterprise, or USS Voyager with a mass of 700,000 metric tonnes each. Right now the only way to get that much material into space in a reasonable timeframe is to use materials already there. I used to have a sliced and polished section of a nickle-iron meteorite about 2 in by 3 in that had Peridot/Olivine bubbles all through it, about 1/4 inch in diameter. This would fit the low-gravity melt forming bubbles with essentially a slag filling the bubbles rather than a gas. Steelwolf, I have a couple nice pallasites too. An Imilac (Chile) and a Seymchan (Russia). Why is it that "Metallic asteroids are thought to have started out as blobs of molten iron floating in space." Except for the below notions, these probably don't just form "out of the blue". It also seems likely that any metallic meteorites that formed from fragmentation of a differentiated body (i.e. with an iron core) would have "bubbles", or the appearance of some kind of "explosive volcanism that might leave pits in the surface." Anything molten hitting a major vacuum will cause outgassing if such volatiles were present. Have to believe that the presence of such features do not demonstrate proof of active volcanism of a small hot body shooting liquid core material into space where it cools. It is not even clear that such hot asteroids would exist for very long to send out much bubbly material. And what would be the driving force for sending out molten metallic debris? I understand a hot core would have pressure, but at this size, it would cool very rapidly. Potential flaw in their reasoning for volcanism. They state in the article that the student thought of volcanic activity in such bodies, and his mentor noted: "you have a buoyant liquid beneath a dense crust, so the liquid wants (sic) to come up to the top." Actually what you have is a high density liquid metal core that has a low density surface of silicates. In this case the liquid will remain at the core due to its much higher density. It must be some other factor which would result in an eruption, and I suppose that could be any volatiles, if enough were present. Seems to me that the volatiles would have been depleted long ago as most of these molten cores were formed by radionuclide decay long ago and outgassing would have been ongoing during the molten state. If one could sample any volatiles inside a bubble, there might be an answer. But there are also various forms of "volatiles". The definition is defined by the compound (decomposition instead), temperature and pressure. Why is it that "Metallic asteroids are thought to have started out as blobs of molten iron floating in space." You seem to have many of the pieces, you just need to tie them together. Large concentrations of iron-nickel metals are thought to arise only in differentiated bodies. The only way to release those metals from the parent bodies' cores is massive impact. Upon impact the hot molten core will be exposed to space. 16 Psyche is believed to be one such object. Soon there after, metal will cool from the outside in due to emitting infrared light. The outer surfaces will become solid metal and the interiors will remain liquid metal for some time in accordance with laws of thermodynamics. Whether metal volcanoes can then happen under those circumstances is an interesting, but unproven idea. Regarding bubbles being common in metal meteorites, you can buy them on eBay for very reasonable prices and examine them yourself. With simple visual inspection, I don't see any. Wow 18 user comments and I have everyone of them on ignore, priceless. Are any iron meteorites like that - fused with silicates, etc.? Clearly the presence of bubbles would require something trapped that would vaporize to some extent. 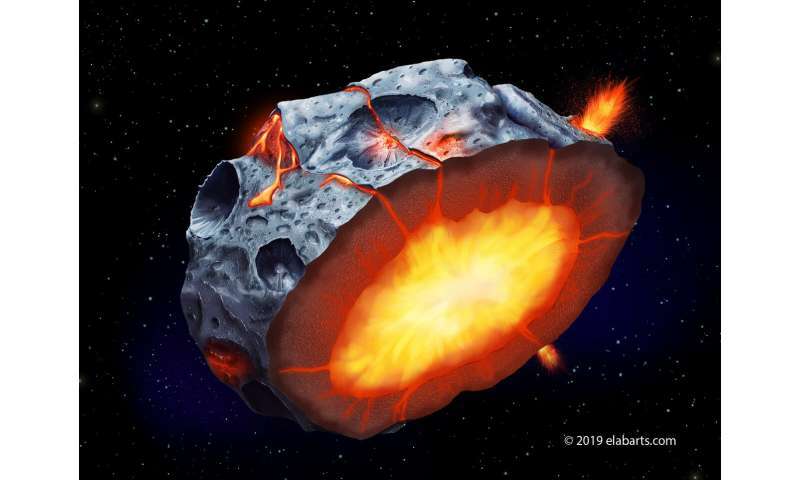 It would have to be trapped due to high pressure in the core for it to form bubbles, and could not be "entrained" as long as the ejecta was still molten. This means any intact bubble should retain a trace of its volatile "gas". Perhaps worth looking for. I believe you may be referring to a rare class of stony-iron meteorites known as mesosiderites. "The asteroid 16 Psyche is a candidate for the parent body of the mesosiderites." Wiki indicates "Psyche seems to have a surface that is 90% metallic (iron)." It also apparently has a thin silicate coat from which these mesosiderites could originate, also from impactors. Psyche is a bizarre place. Little doubt it might be the primary source of mesosiderites, and these just from major hits over eons. Plenty of time during impact to form melts and propel the fused fragments into escape velocity. They could also be remnants of the final breakup of the planetesimal when the core was stripped of its silicate shell. Bombardment by silicate asteroids maybe did that. A cosmic sand blasting of sorts.